A free-flowering antique pink from 1707, 'Bat's Double Red' has layers of rouge-red petals scented strongly of clove. Grow with lavender for a fragrant early summer garden. A late Spring to early Summer bloomer, this plant can be set in the ground in spring when there is still the possibility for a light frost, up until early summer. It can also be planted in early autumn. Antique pinks ruffled blooms are fragrant with the spicy scent of cloves and bring us back to a time when fragrance above all else was treasured. Best crowding border edges and well-drained rock gardens, where it attracts butterflies and bees. If mulching to suppress weeds, use a layer of fine gravel. Winter killed stems can be pruned away in springtime. Divide every 2-3 years to renew vigor—in early spring for zones 3-6 or fall in zones 7-9. Watering Details: Water regularly during first growing season: a little over 1" per week should do. Once established, a little less than an inch per week is fine. Soil pH: Tolerates most soil pH levels, but neutral to alkaline is preferred. If soil is acidic, apply a handful of lime when planting. Fertilizer: Apply a low-nitrogen granular, organically-sourced fertilizer or 2" of compost in springtime. Diseases & Pests: Leaf spots can mar the leaves of Dianthus. Space well apart for good air circulation and apply organic fungicides. Plant: Mounding grass-like foliage with silvery tones. Flowering: Masses of double red carnation blooms. Deadhead to prolong bloom period. Seeds: Flowers will turn into brown seed capsules containing small black seeds, pointed on one end. 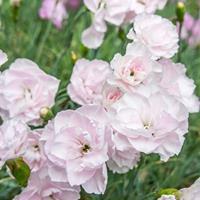 The common name "pinks" refers to the notched petals, which resemble cuts made by British "pinking shears," which are saw toothed scissors used for cutting woven cloth.